Charles II (29 May 1630 – 6 February 1685)[lower-alpha 1] was monarch of the three kingdoms of England, Scotland, and Ireland. Charles II's father, King Charles I, was executed at Whitehall on 30 January 1649, at the climax of the English Civil War. 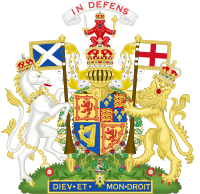 Although the Parliament of Scotland proclaimed Charles II King of Great Britain and Ireland in Edinburgh on 6 February 1649, the English Parliament instead passed a statute that made any such proclamation unlawful. England entered the period known as the English Interregnum or the English Commonwealth, and the country was a de facto republic, led by Oliver Cromwell. Cromwell defeated Charles II at the Battle of Worcester on 3 September 1651, and Charles fled to mainland Europe. Cromwell became virtual dictator of England, Scotland and Ireland, and Charles spent the next nine years in exile in France, the United Provinces and the Spanish Netherlands. Charles's English parliament enacted laws known as the Clarendon Code, designed to shore up the position of the re-established Church of England. He acquiesced to the Clarendon Code even though he favoured a policy of religious tolerance. The major foreign policy issue of his early reign was the Second Anglo-Dutch War. In 1670, he entered into the secret treaty of Dover, an alliance with his first cousin King Louis XIV of France. Louis agreed to aid Charles in the Third Anglo-Dutch War and pay Charles a pension, and Charles secretly promised to convert to Catholicism at an unspecified future date. Charles attempted to introduce religious freedom for Catholics and Protestant dissenters with his 1672 Royal Declaration of Indulgence, but the English Parliament forced him to withdraw it. In 1679, Titus Oates's revelations of a supposed "Popish Plot" sparked the Exclusion Crisis when it was revealed that Charles's brother and heir (James, Duke of York) was a Catholic. The crisis saw the birth of the pro-exclusion Whig and anti-exclusion Tory parties. Charles sided with the Tories, and, following the discovery of the Rye House Plot to murder Charles and James in 1683, some Whig leaders were killed or forced into exile. Charles dissolved the English Parliament in 1681, and ruled alone until his death on 6 February 1685. He was received into the Catholic Church on his deathbed. Charles II was popularly known as the Merry Monarch, in reference to both the liveliness and hedonism of his court and the general relief at the return to normality after over a decade of rule by Oliver Cromwell and the Puritans. Charles's wife, Catherine of Braganza, bore no live children, but Charles acknowledged at least twelve illegitimate children by various mistresses. As his illegitimate children were excluded from the succession, he was succeeded by his brother James. Charles was born in St. James's Palace on 29 May 1630. His parents were Charles I, who ruled the three kingdoms of England, Scotland and Ireland, and Henrietta Maria, the sister of the French king Louis XIII. Charles was their second son and child. Their first son, who was born about a year before Charles, had died aged less than a day. England, Scotland and Ireland were respectively predominantly Anglican, Presbyterian and Roman Catholic. Charles was baptised in the Chapel Royal on 27 June by the Anglican Bishop of London William Laud and brought up in the care of the Protestant Countess of Dorset, though his godparents included his maternal uncle and grandmother, Marie de' Medici, both of whom were Catholics. 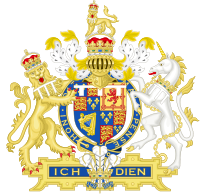 At birth, Charles automatically became Duke of Cornwall and Duke of Rothesay, along with several other associated titles. At or around his eighth birthday, he was designated Prince of Wales, though he was never formally invested with the Honours of the Principality of Wales. Charles I surrendered in 1646. He escaped and was recaptured in 1648. Despite his son's diplomatic efforts to save him, Charles I was beheaded in 1649, and England became a republic. On 6 February, the Covenanter Parliament of Scotland proclaimed Charles II as King of Great Britain in succession to his father, but refused to allow him to enter Scotland unless he accepted Presbyterianism throughout the British Isles. Cromwell was appointed Lord Protector of England, Scotland and Ireland, effectively placing the British Isles under military rule. Impoverished, Charles could not obtain sufficient support to mount a serious challenge to Cromwell's government. 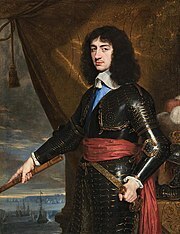 Despite the Stuart family connections through Henrietta Maria and the Princess of Orange, France and the Dutch Republic allied themselves with Cromwell's government from 1654, forcing Charles to turn for aid to Spain, which at that time ruled the Southern Netherlands. Charles raised a ragtag army from his exiled subjects; this small, underpaid, poorly-equipped and ill-disciplined force formed the nucleus of the post-Restoration army. He set out for England from Scheveningen, arrived in Dover on 25 May 1660 and reached London on 29 May, his 30th birthday. Although Charles and Parliament granted amnesty to Cromwell's supporters in the Act of Indemnity and Oblivion, 50 people were specifically excluded. In the end nine of the regicides were executed: they were hanged, drawn and quartered; others were given life imprisonment or simply excluded from office for life. The bodies of Oliver Cromwell, Henry Ireton and John Bradshaw were subjected to the indignity of posthumous decapitations. Charles was crowned at Westminster Abbey on 23 April 1661. He was the last sovereign to make the traditional procession from the Tower of London to Westminster Abbey the day before the coronation. He had already been crowned King of Scots in 1651, the last coronation in Scotland to date. 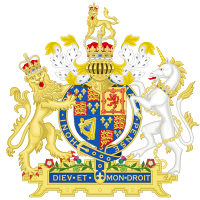 The Convention Parliament was dissolved in December 1660, and, shortly after the coronation, the second English Parliament of the reign assembled. Dubbed the Cavalier Parliament, it was overwhelmingly Royalist and Anglican. It sought to discourage non-conformity to the Church of England, and passed several acts to secure Anglican dominance. The Corporation Act 1661 required municipal officeholders to swear allegiance; the Act of Uniformity 1662 made the use of the Anglican Book of Common Prayer compulsory; the Conventicle Act 1664 prohibited religious assemblies of more than five people, except under the auspices of the Church of England; and the Five Mile Act 1665 prohibited clergymen from coming within five miles (8 km) of a parish from which they had been banished. The Conventicle and Five Mile Acts remained in effect for the remainder of Charles's reign. The Acts became known as the "Clarendon Code", after Lord Clarendon, even though he was not directly responsible for them and even spoke against the Five Mile Act. Adding to London's woes, but marking the end of the plague, was what later became known as the Great Fire of London, which started on 2 September 1666. The fire consumed about 13,200 houses and 87 churches, including St. Paul's Cathedral. Charles and his brother James joined and directed the fire-fighting effort. The public blamed Catholic conspirators for the fire, although it had actually started in a bakehouse in Pudding Lane. Before Charles's restoration, the Navigation Acts of 1650 had hurt Dutch trade by giving English vessels a monopoly, and had started the First Dutch War (1652–1654). To lay foundations for a new beginning, envoys of the States-General appeared in November 1660 with the Dutch Gift. The Second Dutch War (1665–1667) was started by English attempts to muscle in on Dutch possessions in Africa and North America. The conflict began well for the English, with the capture of New Amsterdam (renamed New York in honour of Charles's brother James, Duke of York) and a victory at the Battle of Lowestoft, but in 1667 the Dutch launched a surprise attack on the English (the Raid on the Medway) when they sailed up the River Thames to where a major part of the English fleet was docked. Almost all of the ships were sunk except for the flagship, the Royal Charles, which was taken back to the Netherlands as a trophy. [lower-alpha 4] The Second Dutch War ended with the signing of the Treaty of Breda (1667). In 1668, England allied itself with Sweden, and with its former enemy the Netherlands, in order to oppose Louis XIV in the War of Devolution. Louis made peace with the Triple Alliance, but he continued to maintain his aggressive intentions towards the Netherlands. In 1670, Charles, seeking to solve his financial troubles, agreed to the Treaty of Dover, under which Louis XIV would pay him £160,000 each year. In exchange, Charles agreed to supply Louis with troops and to announce his conversion to Catholicism "as soon as the welfare of his kingdom will permit". Louis was to provide him with 6,000 troops to suppress those who opposed the conversion. Charles endeavoured to ensure that the Treaty—especially the conversion clause—remained secret. It remains unclear if Charles ever seriously intended to convert. The Cavalier Parliament opposed the Declaration of Indulgence on constitutional grounds by claiming that the King had no right to arbitrarily suspend laws passed by Parliament. Charles withdrew the Declaration, and also agreed to the Test Act, which not only required public officials to receive the sacrament under the forms prescribed by the Church of England, but also later forced them to denounce certain teachings of the Catholic Church as "superstitious and idolatrous". Clifford, who had converted to Catholicism, resigned rather than take the oath, and died shortly after. By 1674 England had gained nothing from the Anglo-Dutch War, and the Cavalier Parliament refused to provide further funds, forcing Charles to make peace. The power of the Cabal waned and that of Clifford's replacement, Lord Danby, grew. 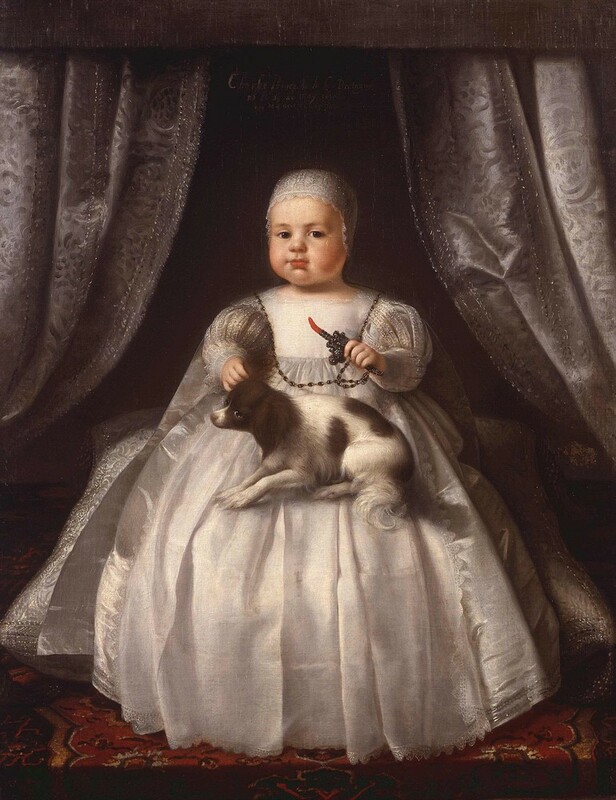 Charles's wife Queen Catherine was unable to produce an heir; her four pregnancies had ended in miscarriages and stillbirths in 1662, February 1666, May 1668 and June 1669. Charles's heir presumptive was therefore his unpopular Catholic brother, James, Duke of York. Partly in order to assuage public fears that the royal family was too Catholic, Charles agreed that James's daughter, Mary, should marry the Protestant William of Orange. In 1678, Titus Oates, who had been alternately an Anglican and Jesuit priest, falsely warned of a "Popish Plot" to assassinate the King, even accusing the Queen of complicity. Charles did not believe the allegations, but ordered his chief minister Lord Danby to investigate. While Lord Danby seems to have been rightly sceptical about Oates's claims, the Cavalier Parliament took them seriously. The people were seized with an anti-Catholic hysteria; judges and juries across the land condemned the supposed conspirators; numerous innocent individuals were executed. Fearing that the Exclusion Bill would be passed, and bolstered by some acquittals in the continuing Plot trials, which seemed to him to indicate a more favourable public mood towards Catholicism, Charles dissolved the English Parliament, for a second time that year, in the summer of 1679. Charles's hopes for a more moderate Parliament were not fulfilled, within a few months he had dissolved Parliament yet again, after it sought to pass the Exclusion Bill. When a new Parliament assembled at Oxford in March 1681, Charles dissolved it for a fourth time after just a few days. During the 1680s, however, popular support for the Exclusion Bill ebbed, and Charles experienced a nationwide surge of loyalty. Lord Shaftesbury was charged with treason and fled to Holland, where he died. For the remainder of his reign, Charles ruled without Parliament. Charles suffered a sudden apoplectic fit on the morning of 2 February 1685, and died aged 54 at 11:45 am four days later at Whitehall Palace. The suddenness of his illness and death led to suspicion of poison in the minds of many, including one of the royal doctors; however, more modern medical analysis has held that the symptoms of his final illness are similar to those of uraemia (a clinical syndrome due to kidney dysfunction). On his deathbed Charles asked his brother, James, to look after his mistresses: "be well to Portsmouth, and let not poor Nelly starve", and told his courtiers: "I am sorry, gentlemen, for being such a time a-dying". On the last evening of his life he was received into the Catholic Church, though the extent to which he was fully conscious or committed, and with whom the idea originated, is unclear. He was buried in Westminster Abbey "without any manner of pomp" on 14 February. Charles had no legitimate children, but acknowledged a dozen by seven mistresses, including five by the notorious Barbara Villiers, Lady Castlemaine, for whom the Dukedom of Cleveland was created. His other mistresses included Moll Davis, Nell Gwyn, Elizabeth Killigrew, Catherine Pegge, Lucy Walter, and Louise de Kérouaille, Duchess of Portsmouth. As a result, in his lifetime he was often nick-named "Old Rowley", the name of one of his horses which was notable at the time as a stallion. ↑ 1.0 1.1 1.2 1.3 1.4 Weir 1996, pp. 255–257. ↑ 16.0 16.1 Miller 1991, pp. 24–25. ↑ Keay 2002, p. [page needed]. ↑ Defoe 1894, p. [page needed]. ↑ 31.0 31.1 Porter 2007. ↑ 33.0 33.1 33.2 Wynne 2004. ↑ "The Royal Charter of the Hudson's Bay Company". Hudson's Bay Company. http://www.hbc.com/hbcheritage/collections/archival/charter/. Retrieved 14 December 2010. ↑ "Nova et Vetera". 1938. p. 1089. JSTOR 20301497. ↑ 64.0 64.1 Bryant 2001, p. 73. ↑ 86.0 86.1 86.2 86.3 Fraser 1979, p. 285; Hutton 1989, p. 262. ↑ 88.0 88.1 Louda & Maclagan 1999, p. 27. ↑ 89.0 89.1 Louda & Maclagan 1999, p. 50. ↑ 90.0 90.1 90.2 90.3 Louda & Maclagan 1999, p. 140. Ashmole, Elias (1715). "The History of the Most Noble Order of the Garter". London: Bell, Taylor, Baker, and Collins. "Bombay: History of a City". The British Library Board. http://www.bl.uk/learning/histcitizen/trading/bombay/history.html. Retrieved 19 April 2010. Bryant, Mark (2001). "Private Lives". London: Cassell. ISBN 0-304-35758-8. Cokayne, George E.; Revised and enlarged by Gibbs, Vicary; Edited by Doubleday, H. A., Warrand, D., and de Walden, Lord Howard (1926). "The Complete Peerage". London: St. Catherine Press. Defoe, Daniel (1894). "History of the Plague in England". New York: American Book Company. http://www.gutenberg.org/etext/17221. Doble, C. E., ed (1885). "Remarks and Collections of Thomas Hearne". Oxford: Clarendon Press for the Oxford Historical Society. Fraser, Antonia (1979). "King Charles II". London: Weidenfeld and Nicolson. ISBN 0-297-77571-5. Gloucester City Council (3 May 2012). "List of Monuments in Gloucester". http://www.gloucester.gov.uk/LGNL/Environmentandplanning/Archaeology/Landandproperty-historicsites-maintenance/ListofMonumentsinGloucesterCity.aspx. Retrieved December 2012. Hutton, Ronald (1989). "Charles II: King of England, Scotland, and Ireland". Oxford: Clarendon Press. ISBN 0-19-822911-9. Israel, J.I. (1998). "The Dutch Republic; Its rise, greatness, and fall 1477–1806". Oxford. Keay, A. (2002). "The Crown Jewels". Historic Royal Palaces. ISBN 1-873993-20-X. Louda, Jiří; Maclagan, Michael (1999). "Lines of Succession: Heraldry of the Royal Families of Europe". London: Little, Brown. ISBN 978-0-316-84820-6. Melville, Lewis (2005). "The Windsor Beauties: Ladies of the Court of Charles II". Loving Healing Press. p. 91. ISBN 1-932690-13-1. Miller, John (1991). "Charles II". London: Weidenfeld and Nicolson. ISBN 0-297-81214-9. Pearson, Hesketh (1960). "Charles II: His Life and Likeness". London: Heinemann. Raithby, John, ed (1819). "Statutes of the Realm: volume 5: 1628–80". http://www.british-history.ac.uk/report.asp?compid=47451. Retrieved 19 April 2010. Raithby, John, ed (1819a). "Statutes of the Realm: volume 5: 1628–80". http://www.british-history.ac.uk/report.asp?compid=47482. Retrieved 19 April 2010. Sheppard, F. H. W., ed (1966). "Survey of London: volumes 33 and 34: St Anne Soho". http://www.british-history.ac.uk/report.aspx?compid=41027. Retrieved 19 April 2010. The Royal Household (2009). "Charles II (r. 1660–1685)". Official website of the British Monarchy. http://www.royal.gov.uk/HistoryoftheMonarchy/KingsandQueensoftheUnitedKingdom/TheStuarts/CharlesII.aspx. Retrieved 19 April 2010. Weir, Alison (1996). "Britain's Royal Families: The Complete Genealogy". Random House. ISBN 0-7126-7448-9. Hanrahan, David C. (2006). "Charles II and the Duke of Buckingham: The Merry Monarch and the Aristocratic Rogue". Stroud: Sutton. ISBN 0-7509-3916-8. Harris, Tim (2005). 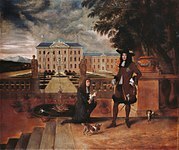 "Restoration: Charles II and his kingdoms, 1660–1685". London: Allen Lane. ISBN 0-7139-9191-7. Keay, Anna (2008). "The Magnificent Monarch: Charles II and the Ceremonies of Power". London: Hambledon Continuum. ISBN 978-1-84725-225-8. Kenyon, J. P. (1957). "Review Article: The Reign of Charles II". pp. 82–86. Miller, John (1985). "Restoration England: the reign of Charles II". London: Longman. ISBN 0-582-35396-3.